Located in the heart of Midtown St. Louis, our restaurant offers contemporary American cuisine with a twist in a charming brew pub atmosphere. 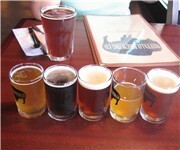 4 Comments about Buffalo Brewing Co.
How Would You Rate Buffalo Brewing Co.? Breweries near Buffalo Brewing Co.